CAT-Law Navigator: Return of the Polar Vortex?? Russia appears to be in a giving mood this holiday season. As the allegations of Russian election tampering escalate, Russia has been kind enough to send the United States another gift – the return of the Polar Vortex. 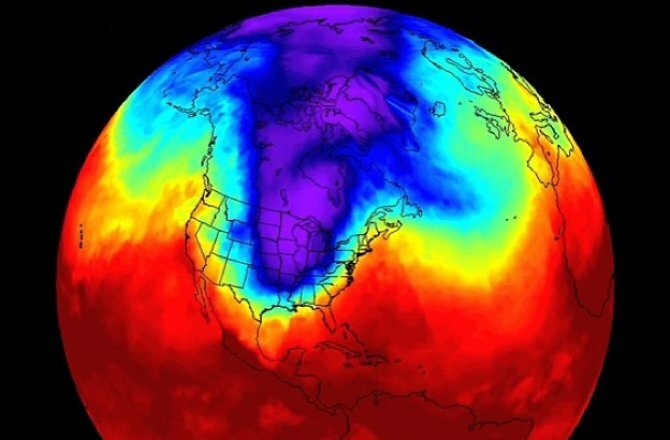 But, what is the Polar Vortex anyway? According to the National Weather Service, the Polar Vortex is a large area of low pressure and cold air surrounding both poles. The term “vortex” refers to a counter-clockwise flow of air that helps keep much colder air near the poles. For some time, meteorologists have noted the build-up of ultra-cold air in Siberia, which now seems destined to hit the U.S. over the next several weeks. Apparently, forecast models of the upper atmosphere are very similar in scale and magnitude as the now infamous January 2014 Polar Vortex and are hinting at formidable shots of cold weather hitting vast stretches of the U.S. during mid to late December and through the remainder of winter. If the forecast models prove accurate, parts of the Midwest, East and Southeast could see temperatures plummet to more than 30 degrees below their historic averages – meaning high temperatures in only the single digits and lows well below zero. On the bright side, these forecast models could also mean significant needed rain in California and possibly huge snowfalls in the Rockies. It is currently unclear what the impact would be to the U.S. economy from this latest chapter of the Polar Vortex franchise. If the forecast models are even close to being accurate, which is always debatable, the potential cost to the U.S. economy could approach the $5 billion level experienced in 2014. During our most recent experiences with the Polar Vortex, many in the insurance industry considered the Polar Vortex to be a weather catastrophe as a result of the extensive property damage and business interruption throughout the U.S. Of course, the impact of a 2016-17 Polar Vortex would vary by region and industry. However, many industries could certainly expect greater than normal incidents of freezing pipes along with the potential for power outages. As in 2014, there is also the potential for losses in energy, tourist and transportation sectors as a result of the ultra-cold weather. Similar to the potential impact to the U.S. economy as a whole, the insurance industry can reasonably expect to experience a significant rise in claims if the Polar Vortex in any way mirrors the levels in 2014. As experienced in 2014, there were a plethora of coverage issues resulting from the Polar Vortex including number of occurrences, freeze/thaw damage, deductible/waiting periods, civil authority, ingress/egress and many others. Of particular interest were the positions taken by many policyholder representatives in 2014 that the entire Polar Vortex was actually one occurrence. While no two policies are exactly alike, one can anticipate that policyholder representatives will again trot out the one occurrence argument asserting that the 2016-17 Polar Vortex is one occurrence that encompasses any loss or series of losses arising out of this one alleged event. Consequently, people should not only plan accordingly for these potential gifts from Russia, but the insurance industry in particular should also leave room under the tree for prospective claims that could likewise be forthcoming this holiday season.